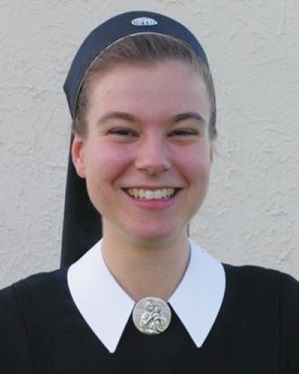 My name is Sr. M. Thérèse. I was born in Wisconsin and I grew up in the Milwaukee area. I entered the community of the Schoenstatt Sisters of Mary in September 2009, and I received the dress of the sisters in April 2010. As a child, I joined a Schoenstatt Girls Youth group. I always enjoyed coming for the monthly group meetings, as well as for the weekend retreats and summer camps. However, I was more interested in having fun than in learning or listening to the talks given by the other girls youth or by the sisters. Even so, the home-like atmosphere of the Schoenstatt Center and being with the joyful sisters drew me in like a magnet, and so I came as often as I could. As I grew older, I became more involved in the Schoenstatt Girls Youth and I eventually became a leader. This means that I began leading some of the girls’ groups and I also helped with weekend retreats and summer camps for the Schoenstatt Girls Youth. In May 2004, I sealed my Covenant of Love with the Mother Thrice Admirable, Queen and Victress of Schoenstatt in the Schoenstatt Shrine in Waukesha, Wisconsin. The Covenant of Love is a special consecration made with the Blessed Mother in the Schoenstatt Shrine. We give ourselves completely to her and she gives herself completely to us. We promise to give her our good deeds, our sacrifices, and our striving for holiness; and she promises to give us a home in her shrine and in her heart, to educate us into her noble reflections, and to give us the grace to proclaim her and Jesus to the world. From the moment I sealed my Covenant of Love, the Blessed Mother “caught” me. I began questioning, “What is God’s will for my life?” The way of discernment was certainly not easy. I prayed very much and tried to hear God’s voice above the noise of daily life. Finally in the summer of 2006, I experienced a moment of grace. During a discernment retreat at the Schoenstatt Center, I recognized without a doubt that God was calling me to be a Schoenstatt Sister of Mary and I was able to say yes. Today I work in the Diocese of Lincoln as the youth sister for the Schoenstatt Girls Youth. I lead monthly meetings for the girls in schools and in homes. Together with the girls, I plan and run camps and activities for girls at our shrine in Crete. As youth sister, I want to help form the girls into pure, noble women in the image of Mary. Through the Covenant of Love, she will mold them into instruments who can bring Christ to their surroundings, whether they are called to the married life, single life, or consecrated life. Looking back, I see my vocation as a precious gift from God. He placed His call into my heart and gave me the grace to respond. United with Mary, I hope to bring the love of Christ to many people.